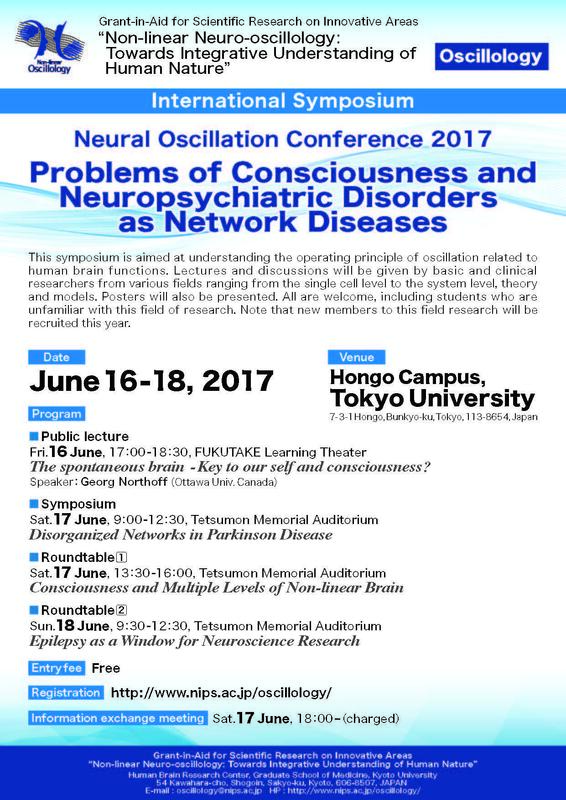 This symposium is organized by a new academic field research "Non-linear Neuro-oscillology: Towards Integrative Understanding of Human Nature" and is aimed at lectures by researchers in various fields from the single cell level to the system level, theory and model and discussions on the operating principle of oscillation related to the brain functions. Poster presentations will also be held. In this year, new members will be recruited. All are welcome, including students who are new to the oscillation research. Programs　※ The lecture and presentations will be given in English. Invited symposiasts / speskers：Izhar Bar-Gad（Bar Ilan Univ.）et al. Invited symposiasts / speskers：Georg Northoff （Ottawa Univ.）et al. Invited symposiasts / speskers：Christophe Bernard（Aix-Marseille Univ.）et al.